Evolution is extremely flexible in its explanations because there is more imagination than hard scientific evidence. For this reason, it has opened the door for evolutionary scientists to create some of the most far-reaching scenarios ever imagined, and claiming it’s all in the name of ‘science’ which cannot be confirmed and yet claim its superiority (bluffing) to be factual or near factual. Ever since Stephen Meyer’s “Darwin’s Doubt” was published and has been a best seller on Amazon.com in science, various articles have been trying to counter it. Popular Science writer and evolutionist, Carl Zimmer decided to write an article that attempts to counter Meyer’s book and others like it. His article appears in the New York Times which is not surprising because this publication is very pro-evolution. Zimmer’s style in his rebuttal is quite classic for a militant defender of evolution, because he purposely avoids mentioning Meyer’s book for fear of giving it credit and that more people would buy the book as a result. He does refer to Meyer and the rest who don’t believe in neo-Darwinism as “opponents of evolution”. When a theory gets increasingly more complicated as new data is discovered which falsifies it even more and old arguments are looked at with the new data, it means the theory is not valid. A totally new direction is required! The increasingly complicated theory, in this case “evolution” is only resting on man’s imagination to rescue it rather than facts. That is not to say inferences cannot be drawn in science nor advancing growing knowledge with new data, but when conjecture is considered growing knowledge and is so dominate among its explanations, this is not science but rather a cult following. Zimmer suggests that evolution created genetic capacity for a purpose of producing enormous diversity among animals but kept it dormant for millions of years till something triggered its use in a short period of time by evolutionary standards. Correct me if I’m wrong, but nature doesn’t go by future assumptions in order to survive, does it? Does anyone believe evolution relies on predictions of the future which affects what it does in the present? When I was taught about evolution in school, the theory said that evolution relies on what goes on in at the present moment in order to survive! A mindless process doesn’t go by selecting future goals for survival especially many million of years into the future. We humans with a brain can decide on goals that may enhance our lives in some way, this takes a thinking process to do this! Also, many diverse life forms require massive amounts of specified information much like many forms of advanced technology requires massive amounts of specified information. So not only does this conjecture lack observable data, and lack the ability to be replicated, and lack the ability to consider and execute future goals, its explanation of “genetic capacity” lacks a realistic requirement of creating massive amounts of specified information in a short period of time in order to create a diverse group of animals. Meyer puts it this way in his book, functional genes and proteins are not just rare but exceedingly rare within sequence space as science points out. As a result, a random mutational search for specified information would fail, than to succeed, in generating even a single new gene or new protein during the entire history of life on earth! On the other hand, Zimmer fails to show how DNA can originate, and show how mutations are able to obtain new information to build another life form! All what Zimmer does is, assume that evolution just happen to build a “genetic capacity” to be used many millions of years later without explaining why that was required for survival of the fittest in the present. Zimmer also makes a surprise case for evolution or should I say, shocking case for evolution by embracing a global flood! Evolutionists have always attacked the historical account from the Bible. Zimmer suggests that nature had to respond to the killing off of many species from a global flood by triggering the Cambrian explosion using the “genetic capacity” which was somehow prepared many millions of years in advance! What is so very interesting about Zimmer and the authors whom he sights, they use the “Great Unconformity” as evidence for a global flood! Creation scientists have for a long time now, been using the Great Unconformity as evidence for a global flood. Evolutionists however, have rejected using that method for evidence for a global flood, calling it a myth rather than science so why are these guys using the same evidence as creationists treated so differently? We certainly don’t see rebuttals coming from evolutionists on Zimmer’s endorsement of a global flood. So how did Zimmer get acceptance from his peers who previously opposed flood geology? Is it because Zimmer embraced a particular story for his conclusion, that life came from poison which has never been observed in nature nor even replicated in a lab rather than coming from God and that minerals were able somehow to miraculously produce advanced and complex animal body parts in a short period of time. Talk about mythology in trying to explain a major falsification of evolution! Listen, if these evolutionists like Zimmer who now embraced a global flood with the same evidence creationists use through the years demonstrates that not only are creation scientists using the scientific method, but it also shows the lie evolutionists have created on what is and is not science for the purpose of keeping other views out of the science realm. The scientific method is not based on who the person is nor what they may believe in, rather it’s based on a procedure! For example, two mechanics from two different backgrounds, one is a Christian who fixes your car by replacing the spark plugs and the wires, and then an atheist replaces those same parts years later. Some supposed expert writes a review in your local newspaper of the car shop saying the christian’s method wasn’t mechanical because he believes those spark plugs and wires came from God and then say, the atheist used the mechanical method in changing your spark plugs and wires because he rejects the existence of God. This folks is loony logic that most Americans do not believe in! So the likes of Zimmer and other evolutionists have been lying to the public on what science is and is not, all in the name of defending evolution because they are merely basing their bias on who the person is and what he or she believes in when drawing conclusions from the data! But the good news is, nature is astounding, we learn from it each day. God is highly intelligent, way beyond our understanding which is why continuing to study nature on how it works is so fun and important to learn about! Back in 2005, paleontologist David Bottjer from the University of Southern California proclaim a discovery known as…“Vernanimalcula” as an animal which has a bilateral body plan. “Vernanimalcula” was dated within the evolutionary framework of tens of millions of years prior to the Cambrian explosion. He then used this discovery to claim there was no Cambrian explosion after all. David Bottjer is a miltant evolutionary biologist who gained additional notoriety by pressuring the museum in California to cancel a contract from a small non-profit group that had tried to rent part of the museum for a private screening of the pro-ID film. He called it a “creationist” film because it was questioning the power of natural causes concerning fossils in the Cambrian. The modern ID movement is more like theistic evolution than creationism but it does have legit criticisms of Darwinism. He already had a preconception of what he wanted to discover, and being a militant evolutionist, it just wasn’t a typical discovery rather it was something to be used against creationism and the pro-ID movement. We will discuss more about Bottjer’s method of scientific discovery in a moment, but now let’s turn to some other research that tears Bottjer’s claims to pieces! Wow, not only did the co-authors of the paper…Stefan Bengtson, John A. Cunningham2, Chongyu Yin, and Philip C.J. Donoghue say it wasn’t bilerian body plans but it wasn’t even an animal at all! That is just the tip of the ice-berg, the authors also suggested that Bottjer has major bias which clouds his judgement while resorting to what this blog always refers to as drawing a conclusion using evolution for the purpose of shaping and molding a story a certain way rather than allowing the evidence to lead to the conclusions. Evolution is nowhere near the level as the law of gravity is, and even that is questioned because of the “big bang” where “dark matter” is invoked to explain what gravity does not in order to keep the theory alive. The law of gravity requires no such rescue mechanisms. Paleontologist David Bottjer reduces the scientific method to a mere story, because of his hatred towards creationism and the modern intelligent design movement. The critical paper of Bottjer’s work should be applauded for their honesty and they are right, the story of “Vernanimalcula” (which is not a vampire) should be put to rest! Wow, that is one word which describes this incredible find in the Early Cambrian! Some think that the fossil record somehow proves evolution. Most of us who went to school have seen a diagram of the geologic column presented to us as we learned about the story of evolution. It displays smooth progressions over millions of years, and does give you the impression that fossils are always discovered in the same definite order with no problems fossils ever being discovered ‘in the wrong place’. This latest discovery is quite remarkable. Trilobite eyes found in the Cambrian were already astonishing and surprisingly complex due to the fact on where it was found, and now complex eyes with amazingly designed modern optics from an unknown arthropod was discovered! “Despite the status of the eye as an “organ of extreme perfection”, theory suggests that complex eyes can evolve very rapidly. The fossil record has, until now, been inadequate in providing insight into the early evolution of eyes during the initial radiation of many animal groups known as the Cambrian explosion. This is surprising because Cambrian Burgess-Shale-type deposits are replete with exquisitely preserved animals, especially arthropods, that possess eyes. However, with the exception of biomineralized trilobite eyes, virtually nothing is known about the details of their optical design. Here we report exceptionally preserved fossil eyes from the Early Cambrian (~515 million years ago) Emu Bay Shale of South Australia, revealing that some of the earliest arthropods possessed highly advanced compound eyes, each with over 3,000 large ommatidial lenses and a specialized ‘bright zone’. These are the oldest non-biomineralized eyes known in such detail, with preservation quality exceeding that found in the Burgess Shale and Chengjiang deposits. Non-biomineralized eyes of similar complexity are otherwise unknown until about 85 million years later. The arrangement and size of the lenses indicate that these eyes belonged to an active predator that was capable of seeing in low light. Let me begin by asking a few important questions, How does a sudden appearance in the fossil record that has a complex trait like vision could “drive” an evolutionary event? Where are the transitional eyes in the fossil record that are simpler than these which were recently discovered? Was evolution so fast nobody could see the transitional eyes in the fossil record? While the authors invent more stuff into the story of evolution due to another falsification, the evidence points to more complexity and adaptive perfection than was thought possible for animals this early! There are a number of things to take note of, first, let’s do a science experiment by taking a look at a side-by-side comparison of the fossil imprint with a living insect eye, and one notices that it’s virtually no difference in complexity! “The extremely regular arrangement of lenses seen here exceeds even that in certain modern taxa, such as the horseshoe crab,” the authors point out. The eyes were designed advanced enough to give the owner binocular vision! The authors even used the term, “explosion” in their conclusion but with the story of evolution without any evidence of in the fossil record that contain transitional forms of this newly discovered animal. Also, one cannot call this a “trigger” of the Cambrian explosion! It would be like saying, a rocket appeared abruptly which then triggered a trip to the moon! Talk about completely and utterly nonsense! By the way, evolutionists for years have been trying to refute, the Cambrian explosion , claiming it wasn’t really an explosion (another illusion) but here we find authors who most likely dislike creationism or intelligent design, using the term “explosion” a number of times in their paper! So they find these “organs of extreme perfection” in the early Cambrian with no transitions just giving the public a story about how stuff just happens in evolution. But Christians ought to rejoice in such a discovery and feel blessed, it clearly reveals a Creator, one with an amazing mindset that goes well beyond our understanding that we can learn from and also confirms this as His creation not some mindless process of errors! Radiometric dating with comparisons of calcium carbonate isotopes in fossil shells were used to determine a new time line. By expanding the time line it would quiet down the explosion in the Cambrian period. So geologists from Princeton, MIT, UC Santa Barbara, and Washington University made their assumptions with calcium carbonate isotopes which they argued changes ocean chemistry and thus gave us the appearance of an explosion. What is omitted in this paper? Charles Marshall also had problems with it too in his explanation. It’s intermediate forms, the transitional forms that must have existed between all the phyla. 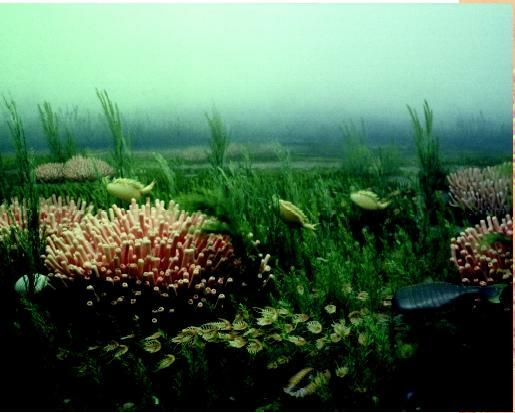 The Precambrian fossils consists mostly of bacteria and microbial eukaryotes! Then all of a sudden it jumps to higher levels of life for example, Trilobites, show up at about 525 million years in the evolutionary time frame but no pre-trilobites have ever been found. Scientists are not observing microbes becoming cnidarians, or Ediacarans becoming worms in the fossil record! It is assumed that since bacteria and eukaryotes are found in Precambrian fossils, that Trilobites and other animals had evolved. Does this solve the Cambrian Explosion and proves a slow and gradual process? Is this really their best evidence so far? The fact of the matter is, if evolution were true there would be intermediate forms in the fossil record. Also, there would be more intermediate forms than the species themselves. These geologists didn’t explain the Cambrian explosion away, all they did was tinker with the data which deals only with fully complex structured species, revise the time line which is a common practice in evolution because it’s based on assumptions and then made a fraudulent claim (because it has to do with creationism and intelligent design proponents) that wasn’t based on an observation in the fossil record. One of the most remarkable pieces of evidence (for creationism) that perplexes even the greatest of evolutionary thinkers for over 150 years now is the great quantity and diversity of life found in what is called the Cambrian layer of the geologic column. Earlier this year, two papers (here and here) were published in Geology where scientists have found even more animals suddenly appearing in the fossil record! One was found and assumed to be 8 million years earlier while “a variety of novel body plans and ecological strategies already existed among echinoderms, pushing back the timing of important divergences into the lower Cambrian in Spain dating from the middle Cambrian.” These are the most diverse to be found so far according to the paper. It is now confirmed “that all skeletalized metazoan phyla appeared in the Cambrian” which means that every body plan is found in the Cambrian while each discovery they find more animals earlier and earlier. No evolutionary sequence here, they are all coexistent simultaneously. Once more, observations from the layers above the Cambrian period gradually decrease with each successive layer. Once you reach the most recent layers approximately 98% of every thing that has ever lived is extinct. This is obviously diametrically opposite to what would be predicted by evolutionary theory. If evolution was true, then one would see simple organisms in the lowest layers and a gradual increase in diversity and complexity of life as you progress to more recent layers in the geologic time scale. Darwin was certainly aware of this problem, it was thought during that time as well as many years after that the fossil record wasn’t sampled enough but once it was then it would solve the problem or at least come closer to solving it. However, today the fossil record is sampled quite a bit and more observations have only enhanced the problem like many other falsified predictions within the realm of evolutionary theory. So why do scientists who are entrenched into the system avoid dealing with such things as what they observe in the Cambrian layer? It’s because they bought into the philosophy of evolution which entails a metaphysical premise with applications of ‘theory-rescuing’ devices that abandons the scientific method! Dr. Scott Todd, of Kansas University speaks in nature magazine about this very subject, he states and I quote…“Even if all the data point to an intelligent designer, such an hypothesis is excluded from science because it is not naturalistic.” When you believe in a theory in spite of the evidence, it’s a religion unto itself. Some scientists were drawn to Christianity while others went to the modern intelligent design movement but the reason why this philosophy mentioned by Dr. Scott Todd is put into place is because the alternatives for explaining origins is extremely limited and those entrenched into the system (who want everyone to believe like they do) know this well, various shades of explanations concerning nature depend on two options, evolution which represents naturalism and if it’s not that, then it’s supernatural in origin. There are no others!